Registration will close shortly before the conference. Priority preference will be given to registrations and full payments received by September 15, 2012. The sooner you register, the more likely we will be able to accommodate your workshop requests! Your OLAC 2012 Conference registration is fully refundable less a $25 handling fee through August 31, 2012. No refunds will be given after this date as we must commit the funds for the conference. Use this form to pay for the conference with a credit card or draw funds directly from your bank account using PayPal. When you submit this form you will be taken to the PayPal interface. If you already have an account simply log-in and complete your payment. You can draw funds from your back account or your credit card. If you do not have a PayPal account, you can pay as a PayPal guest with your credit card only. If you want to pay with your back account you can create an account at this time and pay for the registration and you will need a credit or debit card as back-up. You will receive a confirmation e-mail from the OLAC 2012 Conference Committee and a receipt for payment from PayPal. 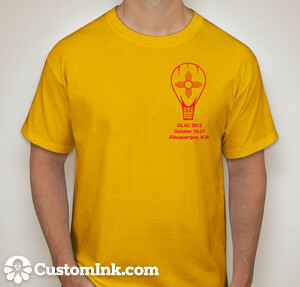 For $15 you can own an official OLAC 2012 T-Shirt! Make your size selection and pay with your registration (except Institutional purchase order registrants). 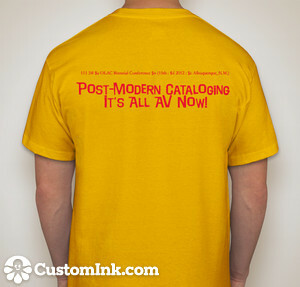 For purchase order registrants or if you decide at a later time to add a t-shirt, use this registration form and select "I am buying an OLAC 2012 t-shirt" option. T-shirts will be available at the registration table only. We cannot mail your t-shirt.